Last week, Morningstar published their Asset Flows Commentary for 2016. As you can see in the chart below, active funds have had more outflows in each of the last two years than they did in 2008. Below, I pulled some of the notable numbers (emphasis mine). Among U.S. equity funds, passively managed funds–led by Vanguard’s offerings–took in $50.8 billion during December, which topped the previous monthly record of $41.9 billion set in November. In December, investors pulled $23 billion out of actively managed U.S. equity funds, extending the group’s streak of outflows to 33 consecutive months. But the preference for passively managed strategies was broader than just U.S. equity funds in 2016. Index-tracking international-stock funds took in $66.6 billion while their active competitors saw outflows of $59.8 billion. Passively managed taxable-bond funds had inflows of $147.8 billion, far outstripping the $46.3 billion of inflows for active bond offerings. AQR was behind Vanguard in active flows, bringing in over $10B. Thanks to the record flows into passive U.S. equity funds, the overall inflows for U.S. stock funds hit its highest monthly total since April 2000, at $27.8 billion. By far, 2016 belonged to Vanguard. The low-cost juggernaut dominated the flows landscape to a remarkable degree. The firm took in $277 billion in new money during the year, finishing at $3.4 trillion in long-term assets. In the last year American Funds, Fidelity, Blackrock, T.Rowe, Franklin Templeton, PIMCO and JPMorgan total outflows were $158B. Vanguard’s active funds took in $20.3B. Active management isn’t dead, but high-fee active managers have a serious problem on their hands. Vanguard’s passive funds took in more in 2016 than iShares, SPDR, Fidelity, and Dimensional combined. $3.4B came out of DoubleLine Total Return Bond Fund in December (AUM rose 7.8% in 2016). 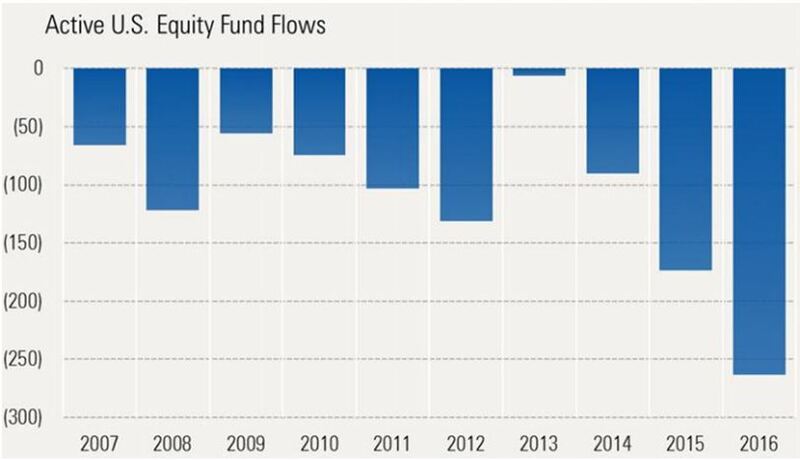 U.S. active equity funds lost $263.8B last year Active U.S. equity funds and haven’t seen a calendar year of inflows since 2005. Assuming that $263.8B went into index funds, at an estimated cost savings of 80 basis points, that’s investors pocketing over $2,000,000,000 a year in fees.